In this C SHARP sample program, you will learn to build a simple dictionary. 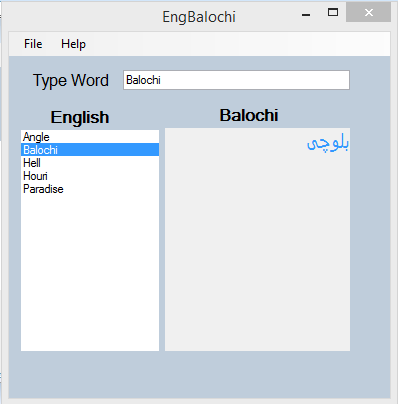 The key terms are English words and each of English word is translated in to Balochi language when the word is selected from the list or when it is typed in to the search box. The word that is typed in the search textbox is searched through the list. If it is found, the word will be selected in the list and its translation will display in a right-hand rich text box. We use Microsoft Access 2007 database to store the English words and their translations. When the dictionary form first loads, the English words will be retrieve from the database file and populated in to a list box. -The New Project dialogue opens. -In the New Project dialogue, under Project Types select Visual C#, and select Windows Form Application under Tamplates. In the Name box type EnglishBalochiDictionary. Text property to EngBalochi and the Name property to Dic. -Drag and drop one Textbox on the form above the list box. Then drag and drop one RichTextbox to the right of the list box. You need to set the Name property of the textbox to Txtbox, and set the Name property of the rich text box to Txtresult. The fore color of the rich textbox is set to MenuHighlight by using the its Forecolor property. Its ReadOnly property is also set to True. This will not allow users to edit the text in the rich text box. As you already knew, to store the English key terms and their EnglishBalochi translations, we need a Microsoft Access 2007 database. Now lets create a database called "data.accdb" in Microsoft Access 2007 and save it in the "bin/debug" directory of your project. This database has one table called Tblterms that has only two fields--Enterm and Balochi. These variables will be used to create their objects of their types. From Data Source select Microsoft Access Database File (OLE DB) and for Database file name area click Browse Button and then from Directory select Microsoft Access Database File that you are created before. If you get information Test Connection succeeded then press Ok Button. click on (+) connection string, appearing connection string. When a user types a word in the search text box TxtBox, This word is used to compare with a word in the list box. If the words are matched the word in the list will be selected and its translation will display in the rich text box Txtresult. to the form load event to make Dic_FormClosed() method callable.